After I finished Marged's Quilt, Anwen said that she wanted a 'blanket' too. I knew that if I I started making her a single sized quilt using EPP there was a good chance that I'd finish it just in time for her to take to Uni! So I decided that I needed to bite the bullet and learn to piece by machine. I did some Google searches and watched some YouTube videos and then cut up some fabric that I'd bought where I could find them. 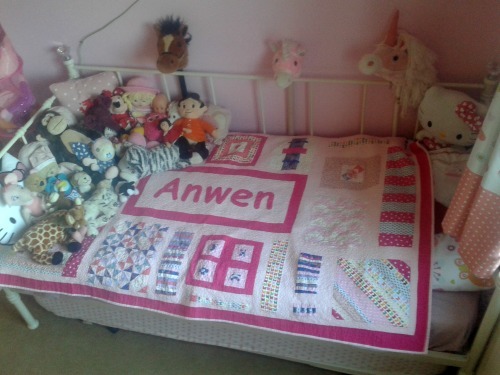 There's a mixture of quilting cotton and cotton poplin as Anwen had requested hearts and butterflies and at the time I hadn't discovered the on-line sewing community 'proper' and modern designer fabrics. I'd drawn my own design out on squared paper, cut out my squares (and four triangles) using metric measurements and a pair of scissors then laid them all out on the living room floor. I then covered them with a rug because I was too scared to start piecing. Some friends of the family had just had a little baby girl and I thought that it would be a good idea to make her a little quilt out of the fabric I had left over so that I could practice my piecing. Because this was before my blogging days I didn't think of taking a picture of the quilt before handing it over. It turned out OK but when I made my calculations when cutting out I hadn't worked the seam allowances properly - I'd thought that two squares cut at 5cm sewed together could be sewed to a square cut at 10cm! By this point I'd found the Missouri Star Quilt Co and Marguerita McManus on YouTube and learned about the quarter inch seam allowance. I went to my LQS and bought myself a cutting mat, 6" x 24" ruler and a 45mm rotary cutter. Now if I remember correctly the smallest squares were 7.5cm. I cut them down to 2". Now, why I didn't cut them to 2.5" I have no idea. But it was only half an inch - surely it wouldn't make that much of a difference? Oh yes it would! By the time I got to the largest squares I was cutting 5 inches off! Needless to say, the quilt shrunk considerably. The next mistake I made was assuming that the foot that came with my sewing machine was a quarter inch foot. I started by piecing together the smallest squares, and then couldn't work out why my pieced 'block' was so much shorter than the border that was supposed to go next to it. I just cut the border down and then sewed them together. When I came to sew the whole quilt together I had to cut quite a few blocks down to fit which resulted in the top shrinking even further. I then had to use some of the solid that I'd bought to back the quilt to make a border to bring the quilt back to size. That done, the quilt top was finished! Only problem was I now didn't have enough solid left for a backing! 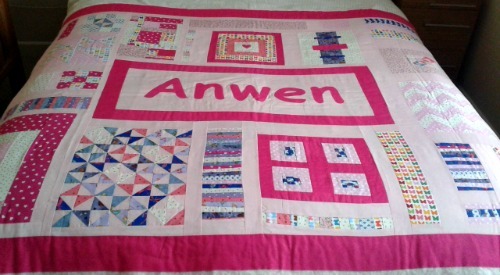 The original plan for the back had been to appliqué Anwen's name in the centre and to add alternating borders from there. I stuck to this plan for the centre and then placed all of my scrappy blocks around it sashed with the baby pink solid. When I had quite large areas of solid between the blocks I just added some of the largest scraps as a single piece. 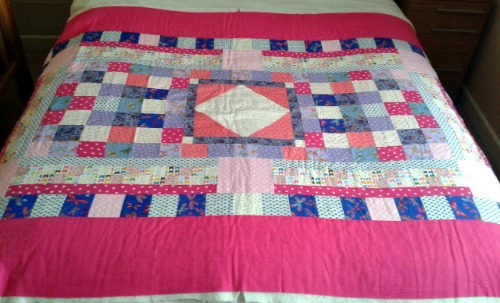 I added a border of the fuchsia pink and we had a completed back! Similar to the front, the back was far from perfect, there were quite a few unintentional wavy seams, but I loved it, it was so much 'fresher' than the front. 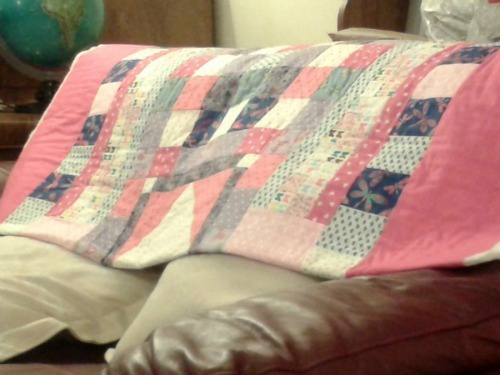 I quickly basted it with 505 and laid it over the back of the sofa whilst I contemplated how to quilt it. And there it stayed for quite some time. Days. Weeks. Months. It was so much bigger than the practice baby quilt, Cara's Quilt and Cadi's Quilt which I'd quilted with my domestic brother. Wrestling those babies through the meagre throat space had been bad enough and they were tiny in comparison with this. Another problem was I couldn't decide which side was now the front. Did I quilt to suit side number 1 or side number 2? In the meantime I'd come to own a mid arm quilting frame (I know I've not really spoken about this on the blog - it deserves a post all to itself - I'll get around to it one day!) And decided to get some practice in on Get Shirty before finally deciding what to do about this one. And then I quilted Caleb's Quilt. 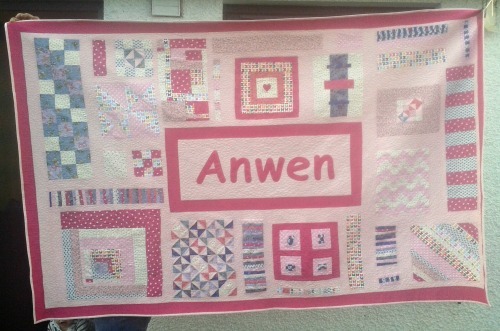 And still couldn't decide what to do about Anwen's quilt. She was starting to get a bit impatient now. Whenever I was working on someone else's quilt she's ask why I hadn't finished hers. In the end I decided that my main problem was deciding which side was the front and which was the back. So I un-basted. This was now going to be two separate quilts. I gave Anwen the choice of which side she wanted me to finish first and let her choose whichever sheet she wanted out of my by now substantially expanding vintage sheet collection. Inspired by Susan's HR Fanclub Quilt I decided to pebble all the sashing and give each block the individual treatment. Now Susan did warn us all, both on her blog and on instagram, that peppling was VERY time consuming and that there were times when she regretted starting. BUT the results were STUNNING. On the off chance that you haven't seen Susan's quilt, please click in the link, you have to see this quilt. Sooooooo, ten hours later, and after a little bit of trimming, this is what the quilt looked like. This is the best picture that I have for showing the colours in this quilt. I did take some pictures outside after I'd added the binding but the light was just awful. See - awful, awful light. Now are you ready for some close ups? 1. My terrible attempt at a feather. 2. 'Caru Ti' is Welsh for 'Love You' It took Anwen quite some time to spot this! 3.There were so many seams in this block I thought that leaving it unquilted would add a nice design element. 1. My first attempt at 'orange peel' quilting, rather unsuccessful but I do like how I quilted the pink HSTs. 2. Some free motion straight lines. 1. One of my favourite quilting techniques. I liked it so much I used it for the darker pink borders. 3. I'd started to run out of ideas for different quilting designs so just stippled this block. 1. Hourglasses which I attempted to orange peel quilt - there were a few too many bulky seams. 2. A chevron block which I free motion straight line quilted. 3. A Wonky log cabin with a different quilting design for each different fabric. 1. A completely improvised block, making the most of the scraps I had left. I used a leaf quilting design on this one. For the central panel I used a slightly larger pebble, and I think I prefer it. I quilted the majority of this quilt using Aurifil 50wt in 2423 but decided I didn't want a contrast in the borders so used 2530 here. 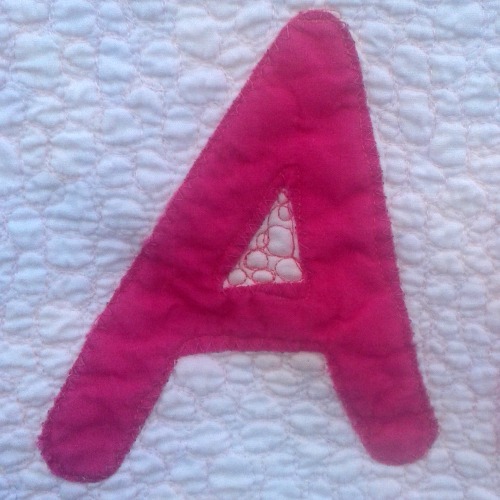 I'm afraid that the lighting was so bad when I took these pictures that it's really difficult to make out the quilting. Take it from me, there is a great deal of room for improvement, but I don't care. This quilt took a large role in my development as a quilter, and I love it! 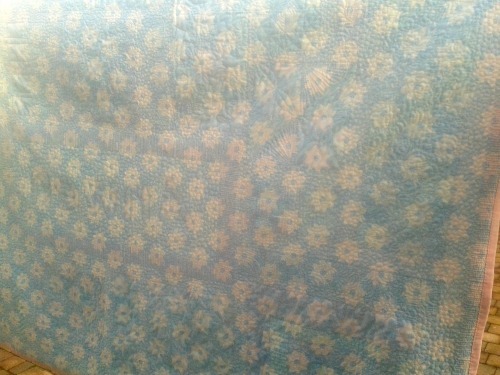 Anwen chose one of my favorite sheets for the back, I'm so glad that this one will be staying in the house. And one of the quilt in place. Yes, she really does sleep with that many teddies on the bed. Makes laundry day a lot of fun for me. As you can see above, the quilt is a little on the small side. I really would prefer it if it overhung the edge a little more and maybe covered the pillow. All that pebbling means that it shrunk a bit during quilting. It shrunk even further during it's first wash. I stupidly didn't take any before and after measurements, I'm going to try and remember to do this in future. The best part about finally finishing this quilt is that Anwen LOVES it. She sleeps under it every night and even took it with her when she spent a few nights at my Mum's over the holidays. She also brings it out to the living room when she'd watching a film and fancies a bit of a lie down. Despite all this use, I noticed tonight that I haven't got a single picture of Anwen with the completed quilt, so I sneaked into her bedroom and took a quickie. So there we have it. It's finished and finally blogged! 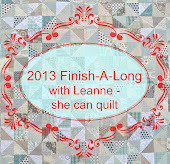 All that's left to do is to link up to Leanne and the 2013 FAL Q4 finishes party! Absolutely lovely quilt. Your quilt journey seems to have started a bit like mine,a bit at a time. Its the gaining in confidence. I love that you put a rug over it. I have a quilt I made for our best friends that still is waiting to be quilted even though the top was finished two years ago. I want it to be soooo good but know that my FMQ is so beginner level. It wont get any better not doing it cos I'm too scared though, doh! What a wonderful quilt!!! I love the story that comes with it as well, and you seem to have done so much since you first started your quilting journey! 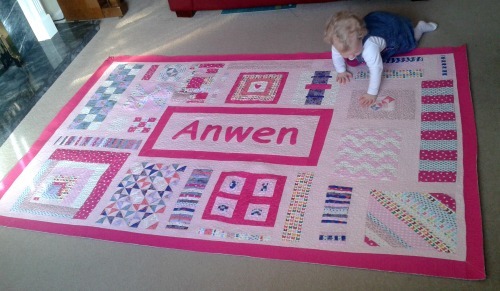 Great quilt and great story too Catrin. 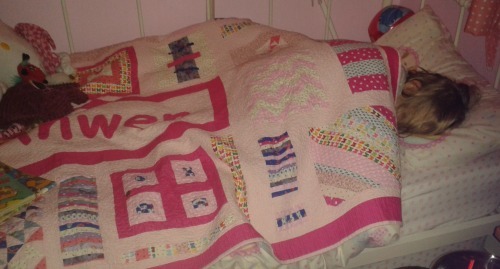 I think you have done a marvellous job with this quilt, you should be really proud of yourself! I love this quilt and the story that goes with it - well done for finishing it, you did a terrific job! This is fantastic, I love the blocks and the quilting is perfect. The Queen of last minute! That was close! My 2013 Q4 FAL round up.